Langkawi, Kedah (Malaysia) – October 12, 2018 (travelindex) – Destination Weddings used to be an expensive affair, however with more couples looking at Asia as a location this has become far more affordable. Couples are now keen on incorporating a mini vacation for their guests as part of the wedding party, as opposed to traditional venues. Couples are now moving away from popular destinations and searching for more under the radar locations such as Vietnam, Malaysia and Japan. The added variety of cultures, food and cost as opposed to hosting a reception in their own country is an added advantage as their budget stretches further. The increase in low cost carrier flights has opened up greater possibilities in term of destinations. Langkawi is unique with its natural elements: rainforest, mountains, white sandy beach, fresh water lake as well as exciting tourist attractions, arts and culture. The sustainable development of the island remains appealing as we head towards modern vicinity whilst maintaining the important aspect of eco-tourism. The island is able to offer world class product and services including Food & Beverage. The many hotels and resorts as well as standalone Food & Beverage establishments are fast becoming ideal venues to hold weddings and receptions for those who are looking for something unique. The Duty Free options specifically alcohol purchase offers huge savings. The easy connectivity and accessibility from KLIA as well as direct flights from Singapore, Kuala Lumpur and China is an advantage making it an ideal destination wedding getaway. The numerous tourist attractions which are easily accessible create an exciting holiday itinerary for the wedding party which makes an advantage to book longer stays as compared to the trend of 3 days 2 nights in general. The island deep rooted in Malaysian culture, heritage and history has a huge potential to showcase multi-cultural wedding ceremonies compared to other destinations that are only able to cater to western and one common cultural wedding. This makes Langkawi not only an exciting island getaway but also a rich cultural experience for the wedding party. 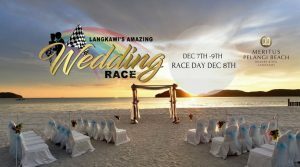 The first ever Langkawi Amazing Wedding Race scheduled to take place December 8th 2018 allows 50 couples a chance to win a FREE DREAM WEDDING. Meritus Pelangi is giving away RM500,000 worth in savings for wedding and reception for up to 200 invitees per winner including a complimentary wedding and reception as a grand prize. All participants stand a chance to also walk away with great savings from participating vendors. Couples will have to take part in multiple levels of puzzles, problem solving, physical activities, and challenges that are wedding related which will show case the entire island of Langkawi as a destination and Meritus Pelangi as the ideal wedding venue. The couples will be given a list of tasks that they need to complete. These tasks will take place all over the island and will also include activities at the tourist attractions and famous spots in Langkawi. The race will kick off at 8am and the participants have up to 7pm to complete their tasks. In light of the road safety, a car and designated driver will be appointed to each couple to assist them with getting around the island. The finish line would be the wedding arch on the beach in front of the Cba, Meritus Pelangi where guests and family members will be encouraged to cheer the participants on. The Langkawi’s Amazing Wedding Race is a collaborative effort by the key tourist attractions in Langkawi, initiated by Meritus Pelangi. The island has come together to show off the beauty and huge potential Langkawi has as an up and coming destination for Weddings in Asia. The Race course would take participants across the island showcasing all its natural beauty and tourist spots in directly acquainting the participants on the type of experiences the island has to offer. The initiative is supported by most of the vendors and tourist spots on the island that are eager to showcase their best. ( and register your details. Pelangi, a Malay word, means ‘Rainbow’ and like its many wondrous colours a Colourfully Carefree experience and discovery await. Meritus Pelangi Beach Resort & Spa, Langkawi situated on the West Coast of the Legendary Island of Langkawi, Kedah Darul Aman, opened on March 16, 1989. Covering an area of 35 acres on a beachfront location, the resort offers a relaxing atmosphere amidst lush tropical environment and award winning landscaped gardens. In such splendour, lie scattered are 355 rooms including the premier beachfront rooms and suites. All characteristics of an affluent yet rustic architecture, designed on the principle of a leisurely Kampung or Village lifestyle, these chalets come thoughtfully equipped with modern conveniences for your comfort. Befitting those who seek the fun, sun and luxury, Meritus Pelangi offers a fine selection of restaurants, recreation activities, entertainment, and shopping with business facilities, all in a blissful setting. In the manicured grounds are two open air, free form swimming pools, the Horizon and Cascade, the former with built in whirlpool. Complete with sundecks and snack bars you can pamper yourself to a lazy time soaking up a golden tan. Its close proximity to all the sights and fascinating excursions not to mention the lively night markets of Cenang, Meritus Pelangi is the ideal location. Nothing provides a more refreshing and colourful getaway in the island of Langkawi for you and your family or a quieter retreat than the Pelangi, your ‘rainbow’ paradise resort. The simple yet stylish feel from the traditional but modern accommodation and finest of Asian hospitality makes this not only a magical place to be but an ideal romantic venue rich in culture and captivating Eastern Traditions! The corner of paradise that is Meritus Pelangi could be the start of your new chapter.